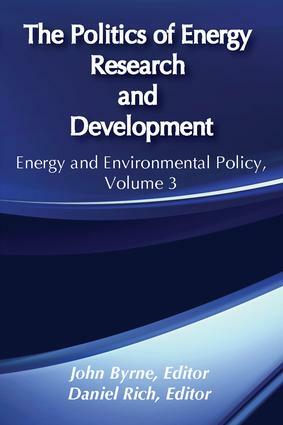 The Politics of Energy Research and Development examines and evaluates U.S. research and development policies to promote nuclear, solar, conservation, and other technology options. This volume is the third in the series Energy Policy Studies, which explores fundamental, long-term social, political, and economic dimensions of energy technology, resources, and use. Contributions represent a wide range of theoretical and policy perspectives, including sociology, economics, political science, urban and regional studies, environmental analysis, and history and philosophy of technology.Contents: Richard L. Ottinger, ""Introduction: The Tragedy of U.S. Energy R&D Policy""; Amor^ B. Lovins, ""The Origins of the Nuclear Power Fiasco""; Richard T. Sylves, ""Nuclear Exotica: Peaceful Use of Nuclear Explosives""; Eugene Frankel, ""Technology, Politics and Ideology: The Vicissitudes of Federal Solar Energy Policy, 1974-1983""; Maxine Savitz, ""The Federal Role in Conservation Research and Development""; J. David Roessner, ""Commercialization Issues in Energy Technology Policy""; John Byrne and Daniel Rich, ""In Search of the Abundant Energy Machine""; and Grant P. Thompson, ""Energy Policy in the Interim: Waiting for the Next Shoe to Drop.